Quotable quotes from the third Quantified Self conference held at Stanford University September 15-16, 2012. Can I query my shirt or am I limited to consuming the querying that comes packaged in my shirt? Figure 1. 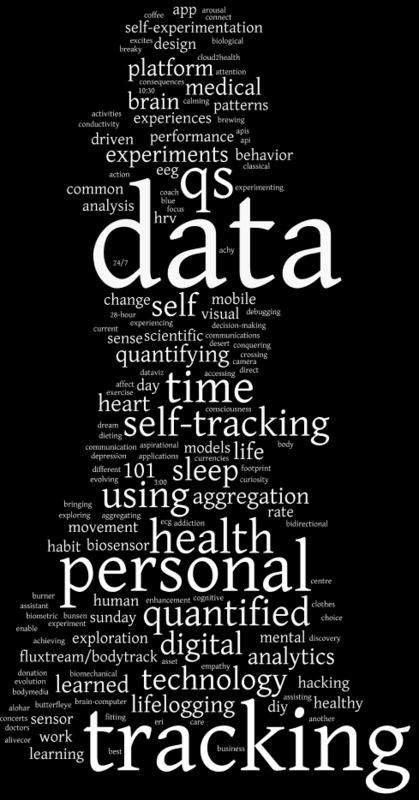 Word Cloud Visualization of Agenda Topics at the third Quantified Self Conference. Sensor Mania! 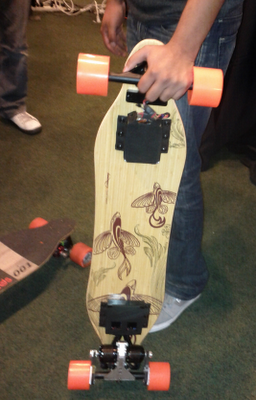 TechCrunch Disrupt Hardware Day! Taking advantage of Sensor Mania! – the exploding wireless internet of things – TechCrunch Disrupt featured a special Hardware day on September 12, 2012 at its annual conference held in San Francisco, CA. 29 companies in a wide range of areas presented their hardware products, as 26 had at a similarly successful event in New York in May 2012. If underwhelming in ‘new new thing’ innovation, the startups at least appeared commercializable for the most part. Perhaps the biggest similarity in the eclectic mix was the high number of Kickstarter projects (the new alpha customer sales and financing platform). The biggest interesting category of startups was biosensors, including a consumer EEG company (InteraXon), a sports sensor training program (GolfSense), an integrated biosensor platform for personalized pain management delivering the equivalent of white noise stimulus to nerve endings (Thimble Bioelectronics (integrating the Somaxis muscle sensor)), and a pedometer watch and social gaming fitness app for kids (Sqord). Another interesting category of startups was internet-of-things companies. Ninja Blocks (‘the API for atoms’) was providing a standard offering of an internet-enabled console block plus five home sensor units (with distance, temperature, motion, camera, etc. sensor capabilities) for $200. Similarly, knut was providing a small, battery powered, Wi-Fi enabled sensor hub for real-time monitoring in the home environment for $80. The other companies were a mix including electric skateboards (Boosted Boards as shown in Figure 1), kitchen products (sous vide cooking (Nomiku) and high-end coffee brewing (Blossom Coffee)), standing desks, flashlights 2.0 (HexBright), rear-view cycling camera unit (Cerevellum), iPad kiosks (Lilitab), and the expected photo, audio (Vers), and gaming-related apps. With the modern expectation of a social layer for everything, together with real-time feedback, data infographics, personalized recommendations, and gamification fun and reward, all received ambiently on the Pebble watch (the smartwatch is the new platform), consumer product delivery is being revolutionized. Just as new media crippled juggernaut industry business models in computing, email, newspapers, TV, and music distribution, an even more fundamental shift is coming to consumer products. The successful game is transitioning from a one-off shelf-buy to an ongoing dialogue with consumers, providing a consumer product service. One way this could be facilitated is by delivering preventive wellness/peak health enhancement services (“condition-as-a-service”) at the growing number of in-store clinics (à la WalMart Vison Centers) at drugstores (CVS, Walgreens) and high-end food stores (e.g. ; Whole Food’s Wellness Club). How soon is the Whole Body and Whole Mind’s Neurofeedback Demo and Service Purchase coming along with Whole Food’s in-store destination edutainment sommelier training? Micro is not just for microformats, hardware miniaturization, microexpressions, micropractices, and political microtargeting, it can be a concept and a platform. One use is in the new concept of microcommunications. Microcommunications are very small communications, possibly carrying a burst of high-valence content, emotional or otherwise. Conceptually, the next node smaller than tweets, microcommunications are ultra-lightweight, where no response is required but could be two-way chatted. One reason that microcommunications are more light-weight is because they are coming from a personified virtual coach as opposed to a real person. 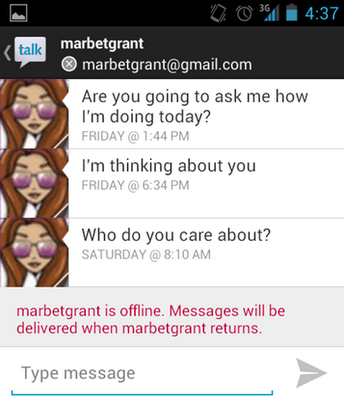 An example of microcommunications is in Figure 1, light-weight SMS messages from a Siri-2.0-like personal virtual coach used in the DIYgenomics Social Intelligence Genomics & Empathy-Building study. Microcommunications from the empathy-building module are displayed. A range of other applications are currently in design, modules for developing and enhancing mindsets of leadership, charisma, motivation, influence, and gratitude.